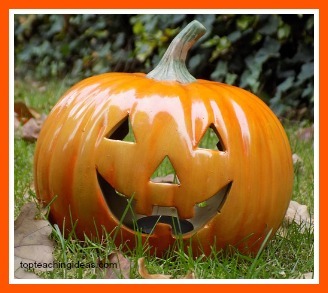 Halloween is such a great time for kids so if you are a teacher, carer or just a motivated mum please look at my Halloween activities for kids below and enjoy! This Halloween activity helps develop a sense of cooperation and teamwork. If one child lets go of their end of the wool, it all goes wrong! So make sure they hold and throw! All you will need is a ball of black wool and a circle of kids! How it works: You give the wool to child 1 who holds on to the end and throws the ball to child 2 on the opposite side of the circle. They then pass it to another child who passes it to a 4th one always remembering to hold on to their end of the wool! This continues until they have made something that vaguely resembles a spiders web or if things don't go quite right a tangle of black wool! My children enjoyed playing the fly balancing game afterwards where they pretend to be the fly caught in the web and have to walk across the strands without falling off. Try it. This is one of my favourite Halloween Activities for Kids. This is a good activity to help the kids with their number skills. The only things you need is several black cut outs of a spiders body and lots of clothes pins. The kids simply put 8 legs on the spiders body. They will love this Halloween Activity for Kids! The kids love wearing these spooky headbands. They are easy to make and help develop their counting skills. First of all and this is the tricky bit, the kids must zig zag the legs.This is good practice for their fine motor skills but they will moan about having to do it. Then all they have to do is glue or staple the 8 strips of zig zagged paper onto the headband and fit it around their head and bingo a spider headband! Don't forget to add the googly eyes to make it even more spooky! One of the 'good to take home' Halloween activities for kids! This activity is a winner with kids. Even if they don't get as far as making the web they will have great fun just playing with the cooked spaghetti! Circles of black wax paper. First: You have to cook the spaghetti and keep it in cold water until you are ready to use it. Next: Drain it and add enough white glue to give it a gloopy consistency. You then tip the spaghetti into the pie tin and let the kids explore the texture. You might never get any further than this but you will get an awful lot of descriptive words from them! The next step is to make the web shape by arranging the strands of spaghetti on the wax paper and allowing it to dry completely. This can be hurried by putting them in a very low oven but make sure you keep your eyes in them or you will end up with brown or even burnt webs! As an add on, I did allow my kids to add some silver glitter to the webs before they dried just to make them a bit more spooky. We hung them around the class with some spiders for our Halloween display. 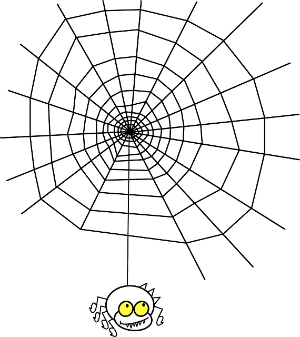 You can use this activity for almost any theme but it does lend itself very well to Halloween and spider activities. And a marble of course. Then I ask them to find a circle of black paper .You might like to have different sizes of paper so you can ask them to find a big circle or a little circle. 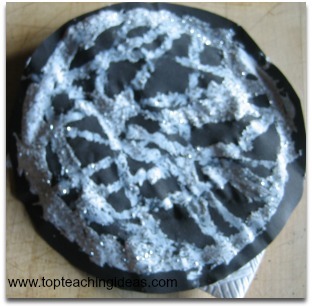 They can then put the paper into the pie tin , take the marble out of the white paint with the spoon and drop it into the pie tin.This is when the creative bit starts and they swirl the marble around in the tin until they have made a web [or like it!] and they are happy with their work. I usually ask them if they would like to make it even more spooky and sprinkle some glitter on it . When it is completely dry We make some woolly spiders to go in the centre. One of the coolest Halloween activities for kids eh? 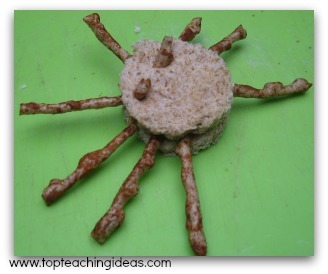 Kids always love making things they can eat so these spider sandwiches were a great success. A loaf of sliced white bread. A packet of Twiglets [or more depending on how many kids you have]. Cut 2 circles out of a piece of bread and spread each piece with cheese. Sandwich together and gently push the ends of 8 Twiglets between the two layers making sure they are evenly spread . Lastly you need to get the kids to put the currants on for the eyes. We ate them at snack time and they all complained that we hadn't made enough! Kids love tearing paper into little bits and sticking them onto something. So this crafty activity is great and can be adapted to any theme or topic you happen to be doing. 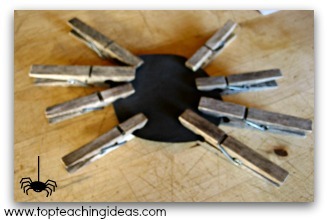 So include this tear and stick task into your Halloween activities for kids this fall. What you need : Pieces of yellow and orange tissue paper. A cut out shape of a pumpkin . Glue, black paint and a little bit of creativity! 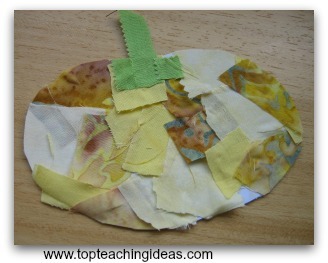 The children tear off small bits of yellow and orange tissue paper and stick them onto the pumpkin, overlapping the layers, until they feel they have covered it enough. To make it look like a Halloween pumpkin they must add a scary face with the black paint. These look good on a display board or they can take them home for mum and dad to keep! 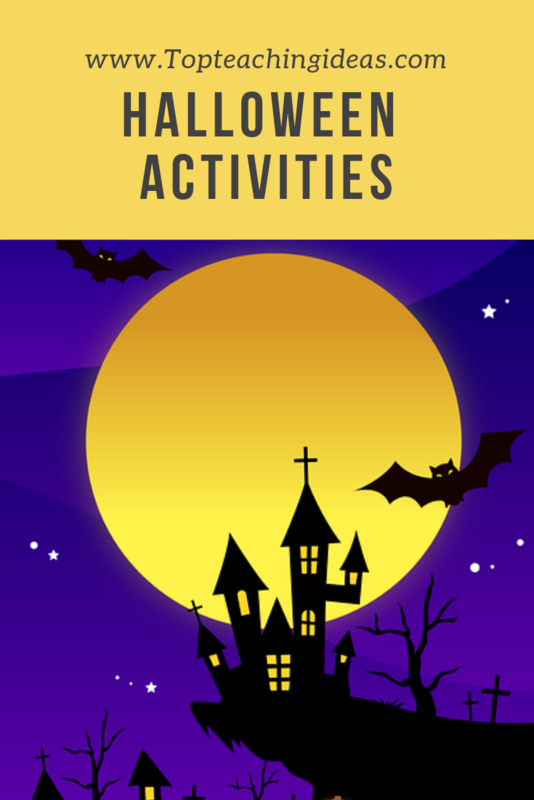 This is one of the most versatile Halloween activities for kids and can be adapted to any theme or topic.It is also good for developing fine motor skills. What you need: A piece of thick paper. A piece of carpet . A tooth pick. 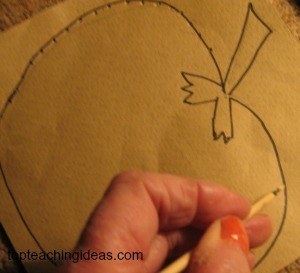 All you have to do is to draw an outline shape on a piece of thickish paper and use a toothpick to make pin holes all the way round the edge. The paper must be on top of a piece of carpet so that the paper doesn't tear.The kids can then hold it up to the window and see the light twinkle through the little holes. 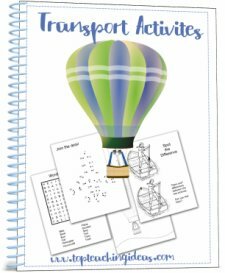 I love this activity and so do the kids! Well most of them ! Be prepared - this is one of the messiest Halloween activities for kids,so have lots of warm soapy water to hand! You will need : Pieces of white sugar paper ,big enough for the kids to spread their two hands side by side on the sheet. A tray of black paint or a pot and a large paint brush. Some googly eyes. What you do : Encourage the kids to place one hand in the tray of paint and print it on the paper. Then they do the same with the other hand and place it ,thumbs touching , next to the first hand so it looks like 2 wings of the bat and the head [the thumbs ] in the middle. Leave it to dry for a bit and then add the googly eyes and there you have it. Your Halloween bat! This is a fun activity to do in Circle Time. 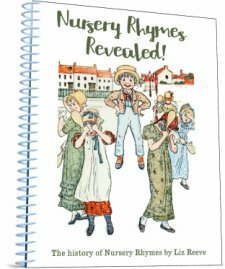 It can encourage the shy children to speak, develop listening skills and extend children's imagination and vocabulary. What you need : A circle of 6-8 children , too many and you lose their concentration! 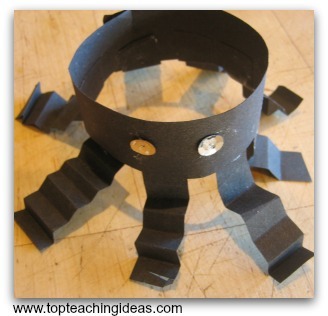 A bucket covered in black paper or a cut out picture of a cauldron. How to play: Children take turns to say something gross to put in the witches cauldron to make a spooky spell! The more horrible it is the more they will like it! I always encourage them to add an adjective to the thing they are putting in just to make it more fun. You can make it more advanced for slightly older children by making each objects first letter match its descriptive word ie googly eyed gremlin! At the end we mix the spell and say Abracadabra and all turn ourselves into something horrible! One of the more fun Halloween activities for kids!